I really enjoyed this story out of Gillespie, Illinois. Construction trades teacher Mark Golasich came up with a solution. He set up a Facebook page and invited local residents to purchase small projects from the students, paying enough to fund their costs, and more. 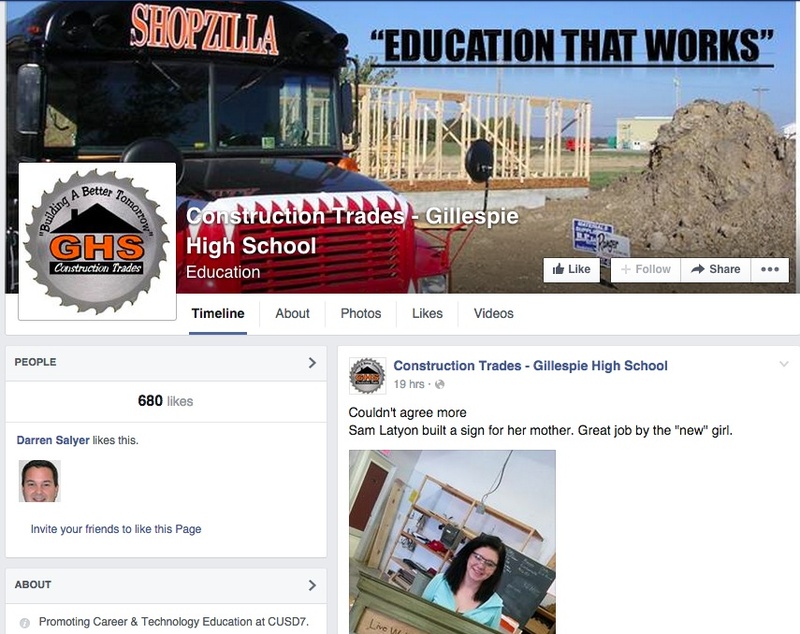 Based on the Construction Trades Facebook page, the Gillespie students can build a lot of stuff: 2 decks, 13 sofa tables, 32 benches, 18 bookshelves, 17 office tables, and 35 wine racks. $22,000 in materials and donations have been made to the construction program. The student-built products are turning a profit to buy more supplies to build more projects to keep the students learning. They are also learning marketing and business development skills, as they interact with paying consumers to fill the orders. The Facebook page makes clear this isn’t a regular business. While the students will do their best to adhere to schedules, Golasich makes clear that safety remains really important and jobs won’t be rushed. So what could be wrong with this initiative? If extended to a larger scale, there can be arguments about unfair competition with operating trades and commercial businesses. I don’t think this is a big issue with small shop projects, but senior students are working on stuff like home decks and garages — and the school, I think, would not have the same overhead, tax and (frankly) marketing costs of a regular contracting business. However, I think these concerns are mitigated by the more practical aspects of the program — high school students develop their trades skills, coupled with a real-world understanding of their work’s value, as they successfully complete market-driven projects. Can you think of similar initiatives worthy of recognition?